A: We have noted relevant reports and we speak highly of this event jointly sponsored by local organizations from Nanjing and Hiroshima. This year marks the 80th anniversary of the Nanjing Massacre which is a heinous crime by the Japanese militarism during the WWII. It represents a painful chapter of history that will not be expunged. Only by deeply reflecting upon the historic lessons and taking history as a mirror can the recurrence of the tragic war be avoided, peace be upheld, and future be explored. Q: Singapore's Prime Minister Lee Hsien Loong said at a forum the other day that Singapore always believes that a prosperous and stable China serves the region and the world, and Singapore is committed to participating in the Belt and Road initiative to enhance all-around cooperation with China. What is your response? How do you comment on the current China-Singapore relations and Singapore's participation in the Belt and Road? A: Singapore is an important member of ASEAN. China attaches importance to its relations with Singapore. With all-around cooperative partnership progressing with the times, China and Singapore have been carrying out extensive cooperation on the basis of equality and mutual benefit. Singapore, located at a unique geographic position, commands advantages in capital, management and services. China welcomes Singapore's participation in the Belt and Road initiative. The two sides are undertaking the China-Singapore (Chongqing) Demonstration Initiative on Strategic Connectivity to enhance regional connectivity. During the G20 Hamburg Summit, President Xi Jinping met with Prime Minister Lee Hsien Loong where the two sides reached important consensus on deepening bilateral relations, especially on strengthening the Belt and Road cooperation. We believe that if the two sides remain committed to working together towards the same direction, the prospect of mutually beneficial cooperation between China and Singapore will be bright. 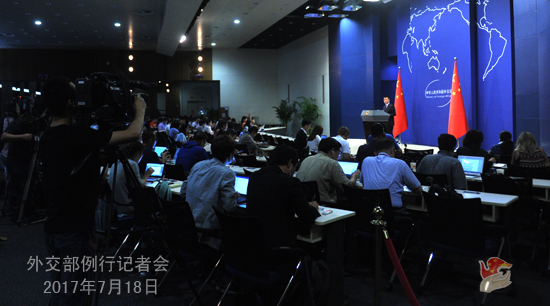 Q: According to media reports, the Chinese government has given a briefing on the situation to foreign diplomats, saying that although China has been very patient so far, China's patience will not last forever. Can you give us any details of your briefings that you have been giving to foreign journalists? Or can you confirm China's patience will not last forever on this issue? A: This case has already drawn wide attention from the international community. Some foreign diplomats in China, feeling shocked and confounded, reached us for facts through diplomatic channels. I want to stress that the facts behind this case are clear. The Sikkim section of the China-India boundary is demarcated, which is recognized by both China and India. The nature of this case is that Indian troops illegally trespassed the demarcated boundary into Chinese territory. People will reach the just conclusion. If Indian wants to achieve its political purposes by sending military personnel across demarcated boundary, China urges India better not to do so. Q: The global credit rating agency Fitch Ratings announced that it has assigned the Asian Infrastructure Investment Bank its highest possible rating - AAA with a stable outlook. This marks another top-notch rating for the AIIB from the top three international credit rating agencies. On June, it received an AAA from Moody's Investors Service. What is your comment? A: As an initiator of the AIIB, China is glad to see the AIIB winning the highest ratings from the Fitch and Moody. Facts have shown that the operation and the prospect of the AIIB have been well acknowledged by the international community. We believe that these ratings will help the AIIB better fulfill its duties in enhancing infrastructure connectivity and sustainable development of the economies of all members. Q: Yesterday, you spoke favorably of the ROK government proposing to hold military talks with the DPRK. But Spokesperson of the US State Department Sean Spicer said on July 17 that any type of conditions that would have to be met to have dialogues with the DPRK are clearly far away from where we are now. British Foreign Secretary Boris Johnson and Japan's foreign ministry spokesman also said that now is a time to raise pressure on the DPRK, not to hold dialogues. Do you have anything more to say? A: Yesterday I talked about China's position. We support the DPRK and the ROK in improving their relations and seeking reconciliation and cooperation through dialogues. I also said that all concerned parties of the international community should understand and support the two sides in having dialogues and improving their bilateral relations, and play a constructive role for the proper settlement of the Korean Peninsula nuclear issue. We have said repeatedly that persevering peace and stability in the Korean Peninsula and in Northeast Asia serves the fundamental and long-term interests of the international community, especially regional countries. In order to achieve this goal, the international community, while making clear its firm opposition against the DPRK's violations of the UN Security Council resolutions, needs to step up efforts to promote peace talks. None of these two points are dispensable. We could learn from the evolvement of the Korean Peninsula nuclear issue that positive outcomes were earned through nothing else but dialogues only, and confrontation and pressurization only will lead to nothing but greater tension. With all these positive messages released by relevant parties on improving DPRK-ROK relations and ameliorating the situation on the Peninsula, the international community, the concerned parties to the Korean Peninsula issue in particular, should grab this opportunity, show more understanding and support, and press the accelerator pedal, instead of applying the brakes. Q: Did China hold a briefing for foreign diplomatic missions on the boundary stand-off? When was it held? A: I have just said that since the trespassing took place, many foreign diplomatic missions in China were shocked and found it difficult to understand. They sought the facts from China through diplomatic channels. The Foreign Ministry of China maintains close contact with these diplomatic missions on issues of common interest. Q: There was a shooting case in the Holy City of Jerusalem on July 14 which killed five including the attacker. The Israeli police then announce the city a closed military zone and closed the Al-Aqsa mosque. On the afternoon of July 16, Israel gradually opened up the mosque and the Temple Mount and strengthened security measures. But conflicts broke out again near the Al-Aqsa mosque on July 17 which caused some injuries. What is your comment? How do you view the current Palestine-Israel relations? 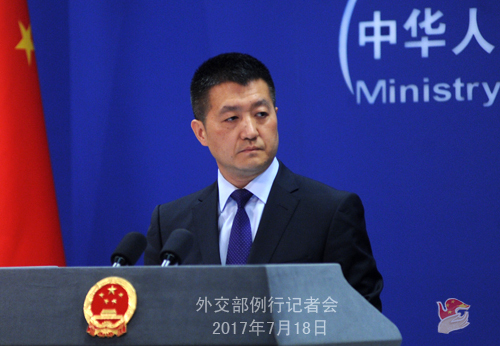 A: China calls on both Palestine and Israel to exercise restraint and take effective measures to avoid escalation of tension. 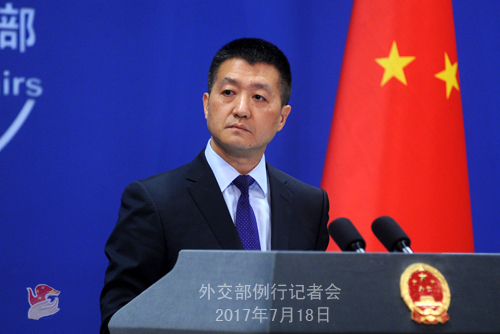 Q: China so far has been very restrained in its reaction on the China-India boundary stand-off incident, so is China running out of patience? At what point will China run out of patience? A: We have repeated our position on this trespassing incident so many times that you must be very clear about that. We keep stressing that India should get a clear understanding of the current situation, take prompt measures to withdraw its personnel who have illegally crossed the boundary back to India's side, so as to avoid further escalation of the situation.